We continue the experiment of expanding participation in ASPB started with the last President’s Letter (http://bit.ly/SecuringFuturePlantBiologist). This letter is part of a collection of resources (http://bit.ly/NextGenerationCareers) about training and jobs in the related areas of synthetic biology and modern plant breeding. We encourage you to spend some time with these resources and add your own thoughts on the topic at Plantae.org and on Twitter (@aspb and #aspbforward). Helping students and postdocs develop technical, logic, and communication skills and then go on to vital roles in industry, academia, and government is at the heart of our mission as plant biologists and technologists. Watching our trainees and mentees choose fulfilling careers and lead satisfying lives is one of the signal joys of being a scientist. When done well, the mentoring relationship prepares the next generation to be great colleagues, leaders, and citizens—and helps trainers become better at our jobs. However, there is a humongous elephant in the training room: we train for careers that are known to us, using technologies that are currently available or on the near horizon. Today’s technologies and domain area knowledge evolve so quickly that we can only guess at which skills and know­ledge will transform agriculture, health care, and education over the 40-plus–year career expectancy for a current undergraduate or predoctoral student. 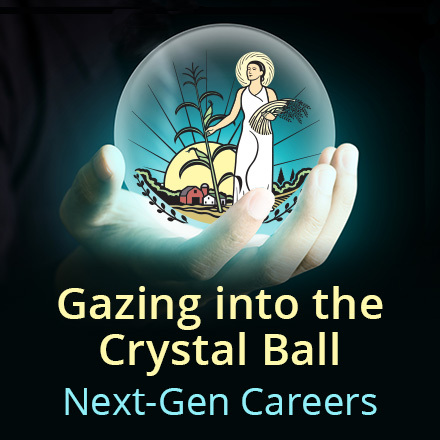 Although there is no crystal ball, two vibrant and related areas will continue to offer career opportunities in the public and private sectors: synthetic biology (SynBio) and precision agriculture–driven plant breeding. SynBio is to biology careers today what recombinant DNA was in the 1980s: an area of explosive scientific development, investment, and job growth that is building a next-generation biotech economy. Some SynBio job growth is in universities, but a lot will continue to be in companies—as the $3.8 billion that the top SynBio outfits raised in 2018 attests (Schmidt, 2018). This is excellent news for plant biologists because a fair number of SynBio jobs already require plant science training, ranging from specialized metabolism through sensing and signaling circuits to plant–microbe interactions. The number of plant-related SynBio jobs is sure to grow as the field continues to move out from biomedicine into the enormous agricultural industry. We are seeing more and more plant-related SynBio start-ups coming in behind the microbial ones, targeting the engineered synthesis of plant products in microbes or applying microbial systems to agricultural problems. What sort of training opens doors to SynBio careers? At this point there are relatively few specialist SynBio graduate programs around the world, with more in Europe than North America, but universities are sure to create more of these. The existing programs are not plant-centric; they provide training dominated by a few platform organisms such as E. coli and yeast, and this is not tomorrow’s SynBio world of agricultural crops and forest trees. In the longer term, careers in plant SynBio will require training in computer skills and engineering principles, which can be acquired via a few good foundational courses or disciplined self-study. Beyond that, to really add value in the job market, trainees need thorough knowledge of the universal bioscience basics—physical and organic chemistry, biochemistry, genetics, genetic and metabolic regulatory networks, and evolution—plus the plant basics—morphology, taxonomy, physiology, and ecology. This classical skill set is the grounding needed to understand new SynBio technologies, as well as the technologies that eventually will supersede them. Most importantly, these skills are essential to figuring out how to apply new technologies to solve important problems. And what is an “important problem”? SynBio’s answer is “one we must solve to make a prosperous and sustainable world.” SynBio’s stress on utility is one of its hallmarks. Another hallmark distinguishing it from biology as we have known it is that SynBio transforms biology from a descriptive discipline into a prescriptive and constructive one. SynBio doesn’t stop at describing nature’s intricate beauty; it goes on to redesign and rebuild nature to meet needs. Make no mistake: SynBio is a revolution. In much the same way that biology is being transformed from a descriptive science to a prescriptive one by synthetic biology, plant breeding is being radically transformed and contributing to a rapidly changing agricultural enterprise. Now as much as ever before, the role of plant breeding in agriculture is to develop new solutions to the biotic and abiotic limits on crop production, and to do it faster, better, and more efficiently than last year. The classic core sciences that enable new variety development—plant physiology, genetics, agronomy, statistics—were joined by molecular biology and genomics over the past two decades. These technological and business developments created job opportunities for those trained in laboratory, mathematical, and computational sciences. However, plant breeding is now changing even more rapidly with the addition of data-intensive precision agriculture. This includes a suite of evolving imaging and sensing technologies for breeding and on farms, and these are creating avalanches of phenotypic information and environmental metadata. The marriage of these modern genotyping and phenotyping tools, along with rich climate data, creates the opportunity for precision agriculture at scales ranging from individual fields to large regions. Thus, whether future scientists generate their own big data or merge diverse data types to generate insight, fluency in data manipulation and analytics using common programming languages such as Python and R will be critical to handle the available volumes of data. This will be the price of admission for job success in next-generation agriculture. Farmers see the value of big data in agriculture, and industry is anticipating rising demand for digital agricultural tools. Connected hardware devices in agriculture are projected to increase globally from 13 million in 2014 to 225 million by 2024 (Machina Research, 2016), and the majority of new agricultural machinery is now equipped with precision agriculture features. Growers increasingly seek digital advisory services to inform their farm management decisions in areas ranging from equipment logistics and pest and disease control to seed product selection and harvest timing. To enable accurate and precise recommendations at the commercial agricultural scale, these services must be backed by millions of data points that track biological as well as environmental variables. The ongoing big data revolution in agriculture enables plant breeding to design the next generation of sustainable solutions to biotic and abiotic limits on agriculture more precisely, and to tailor them to function synergistically. This precision agriculture–driven approach to plant breeding is creating employment opportunities for experimentalists and data scientists trained in diverse fields to collaborate in new ways. For example, the expertise of breeders, synthetic biologists, microbiologists, biochemists, and formulation experts is needed to develop new combinations of chemical or microbial products with specific elite crop germplasm to create sustainable, productive solutions for farmers. As such, careers in the precision agriculture and plant breeding space increasingly span multiple disciplines and—especially—interaction between disciplines. To access these careers, a solid grounding in one of the core biological or environmental sciences, as well as engineering and data science, will always be critical. But from now on, new private- and public-sector hires should expect to deploy their expertise in multidisciplinary teams that redesign agricultural production systems. This diverse, team-based approach creates meaningful solutions to the critical challenge of sustainable agriculture—and careers that look more like expeditions than excavations. In the past, your PhD degree training more or less set you up for the rest of your professional life. You needed to update and upgrade, but not to upend everything and move on to something new. Now everyone needs to stay fresh over decades and to prepare for the future by thinking opportunity instead of security, change instead of stasis, and the wide world instead of the narrow cloister. This year, ASPB is focusing attention on the science and career opportunities behind these topics. SynBio is front and center, with a Focus Issue of Plant Physiology in March 2019 (http://www.plantphysiol.org/collection) featuring 11 Update reviews from SynBio leaders and eight research papers. There will be a SynBio major symposium as the concluding session of Plant Biology 2019 (http://plantbiology.aspb.org/), in San Jose, California, followed by a standalone two-day SynBio satellite meeting (http://bit.ly/PlantSynBio2019). These are being supported by a set of webinars, blogs, interviews, and other activities over the coming months, which we will link to at the Plantae collection associated with this letter (http://bit.ly/NextGenerationCareers). Modern agriculture and quantitative job skills training are well represented at Plant Biology 2019 (https://plantbiology.aspb.org/). For example, we will feature a major symposium on the Future of Food and Agriculture. There will be workshops relevant to the topics covered in this letter, including Mathematical Plant Biology and Machine Learning, as well as Careers Beyond Academia and Commercialization in Plant Science. We look forward to keeping in touch with you in San Jose, at Plantae, and on Twitter! Machina Research. (2016). Agricultural IOT will see a very rapid growth over the next 10 years. http://bit.ly/MachinaResearch. Schmidt, C. (2018). These 98 synthetic biology companies raised $3.8 billion in 2018. SynBioBeta. http://bit.ly/SynBioBeta2018. Laura Grapes is product systems development lead in North America breeding at Bayer Crop Science, http://bit.ly/LauraGrapes. Andrew Hanson is C. V. Griffin, Sr., Eminent Scholar, University of Florida (@ADHansonLab). Rob Last is ASPB President and Barnett Rosenberg Professor, Michigan State University (@Biokid001). Don’t Forget to Cast Your Vote Online! ASPB members are invited to vote for president-elect and elected member to serve on the ASPB Council, as well as for corresponding members. Please cast your vote by May 24, 2019, at https://aspb-excom.secure-platform.com. Preparations for Plant Biology 2019, August 3–7, and Plant Synthetic Biology 2019, August 7–9, in San Jose, California, are in full swing! Abstract submission and registration are open at http://plantbiology.aspb.org and http://plantsyntheticbiology.org. This year’s location has lots to offer—from proximity to California wineries, redwoods, and beaches to the spirit of innovation that fuels Silicon Valley (https://www.sanjose.org/). Plant Biology 2019 resonates with the high-tech energy of Silicon Valley. This year marks the introduction of digital e-posters and features presentations on synthetic biology as well as innovative approaches to big issues such as the future of agriculture. New workshops will energize plant scientists ready to join the start-up culture and those interested in using computational biology or machine learning to solve plant biology problems. For the first time, Plant Biology 2019 will display digital e-posters. Two hundred presenters who choose this new format will use online editor software to create dynamic posters that can include high-resolution images, videos, sound files, and slide shows, as well as links to external content. At Plant Biology 2019, attendees will be able view any of the e-posters on offer at the 25 display screens, expanding features at the touch of the screen. Presenters can make their posters available for download both before and after the conference. You can learn more about e-posters at https://bit.ly/2Blno4v. Receptor signaling pathways have key functions in plant development, immunity, and environmental responses. Giles Oldroyd (University of Cambridge) will speak on receptor signaling in symbiotic associations with nitrogen-fixing bacteria. Cyril Zipfel (University of Zurich) will speak on receptor signaling in plant immunity. Jenny Russinova (VIB–Ghent University Center for Plant Systems Biology) will describe her work on brassinosteroid signaling. Julia Santiago Cuellar (University of Lausanne) will speak on cell wall signaling and remodeling. The organizers are offering a great lineup of workshops addressing work at primarily undergraduate institutions; cutting-edge science, publishing, and commercialization; and careers and networking (https://bit.ly/2D5bjR4). Mathematical Plant Biology: A Collaborative Session will discuss interdisciplinary collaboration, demystify the language of computational scientists, and help match computational biologists with plant biologists who have an interesting problem to tackle. Want to inspire the next generation of plant scientists? At the PlantingScience Workshop, you’ll learn more about the award-winning PlantingScience online mentoring program and results of NSF-funded research on the program’s efficacy. You will also learn and practice techniques to improve your effectiveness at mentoring student-led independent investigations. Navigating the decision of if and when to publish a preprint can be nerve-racking. At the When to Preprint/When to Publish workshop, editors from ASPB’s journals Plant Direct, Plant Physiology, and The Plant Cell will host a discussion focused on current decisions scientists must make when publishing their work. Computer science start-ups built the high-tech Silicon Valley culture; plant science also abounds with commercial potential, including applications that will help humanity survive emerging challenges of climate change, decreasing arable land, and increasing population. How to decide whether to commercialize a promising aspect of your research? Attendees can get up to speed on intellectual property, investment, and partnership at the Commercialization in Plant Science workshop. Get in touch with Phil Taylor (phil.taylor@bayer.com) if you would like to pitch your idea to a panel of scientists, intellectual property specialists, investors, entrepreneurs, and strategic partners. The best pitch wins a prize! ASPB is developing more entrepreneurship activities; up-to-date information will be posted on the Plant Biology 2019 Plantae network (https://community.plantae.org/organization/plant-biology-2019-meeting/dashboard). How Machine Learning Can Be Used to Solve Plant Biology Problems will reveal how computers can be harnessed to learn more from data and generate models that can predict biological phenomena of interest. The workshop will combine presentations and discussions with hands-on use of online machine learning tools. Information about travel documents for international attendees can be found on the conference website at https://bit.ly/2Uzu866. Childcare is available on-site at the convention center for $10 per child per hour. A nationally bonded childcare provider will provide this service, which can be reserved during registration or at any time before the meeting. For more information, email PBregistration@aspb.org. ASPB members get the best rates. To renew your membership, visit https://aspb.org/membership/. Attendees get a $50 discount for Plant Synthetic Biology 2019 when registering for Plant Biology 2019. Updates will be posted on the Plant Biology 2019 website (http://plantbiology.aspb.org/), on the Plant Biology 2019 Plantae network, and on Twitter using the #plantbio19 hashtag. Keep an eye out for the Plant Physiology (http://www.plantphysiol.org/) special issue on synthetic biology in March featuring 11 Update reviews on various topics in synthetic biology. Listen to speaker June Medford in the Plantae webinar Plant Synthetic Biology 101 (http://tinyurl.com/JuneMedford). For more information and conference updates, follow @PlantSyntheticBio2019 and #PlantSynBio19 on Twitter, and join the Plantae Synthetic Biology network (https://community.plantae.org/organization/synthetic-biology/dashboard). The excitement starts on Wednesday, August 7, with Plant Biology 2019 Major Symposium 5, The Future of Plant Synthetic Biology. Then, the Plant Synthetic Biology conference continues with speakers from the public and private sectors, including Aileen Mastouri (Joyn Bio), Nicola Patron (Earlham Institute), Karsten Temme (Pivot Bio), and Vincent Martin (Concordia University). Attendees interested in giving a 15-minute talk at Plant Synthetic Biology 2019 should submit their abstracts by June 14. Each attendee selected to present a talk will receive a $1,000 travel award covering registration and two nights in the conference hotel. A full article will appear in the May/June issue of the ASPB News. Each year, ASPB, through its Women in Plant Biology Committee, awards travel grants to early career women investigators to attend the Plant Biology annual meeting. Through a donation from the Sharon Gray Foundation (https://sharongrayfoundation.org/), the 2018–2020 Women’s Young Investigator Travel Awards (WYITAs) will be named for Sharon, who had a passion for and commitment to mentoring women in science. By naming the WYITAs for Sharon, we honor her contributions and seek to continue her legacy. The goal of the competitive process that underpins the WYITA program is to increase attendance of early career women investigators at the annual meeting by providing travel funds. Applications are open to scientists who are within the first five years of their appointment in academic faculty-level positions, government research positions, or industry research scientist positions, as well as experienced postdocs. Selection is based on the science and quality of the abstract submitted, relative to the applicant’s amount of time as an early career investigator; a statement describing why their travel should be supported; and financial need. Eight women were selected this year, and each will receive a $1,000 award to support their attendance at Plant Biology 2019 in San Jose, California. Moreover, several of this year’s awardees have been selected by the ASPB Program Committee to present their research in talks during concurrent symposia. Congratulations to all of the 2019 WYITA winners! In January, NAS announced the recipients of a number awards. 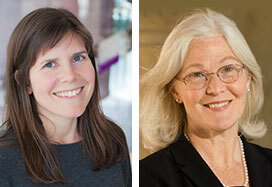 Among the winners were two of the Society’s own: Elizabeth (Lisa) Ainsworth, USDA ARS principal investigator and professor of plant biology at the University of Illinois at Urbana–Champaign (UIUC), and Sharon R. Long, William C. Steere, Jr., Pfizer Inc. Professor in Biological Sciences and professor, by courtesy, of biochemistry at Stanford University. Lisa won the recently created NAS Prize in Food and Agriculture, which recognizes the research contributions of an outstanding midcareer scientist (within 20 years of PhD completion) “at a U.S. institution who has made an extraordinary contribution to agriculture or to the understanding of the biology of a species fundamentally important to agriculture or food production.” The prize is presented with $100,000 and is supported by an endowment created by the Foundation for Food and Agriculture Research and the Gates Foundation. In recognition for “molecular biology insights that explain how to make agriculture more sustainable,” Sharon was awarded the Selman A. Waksman Award. The award recognizes a major advance in the field of microbiology and includes $20,000. Sharon’s work on the symbiosis between plants and nitrogen-fixing bacteria led to the groundbreaking discovery of the nod genes, the products of which enable some plants to fix atmospheric nitrogen. Lisa and Sharon have also been recognized by ASPB. In 1989, Sharon received the Charles Albert Shull Award, an annual recognition of outstanding scientific investigations in plant biology by a member who is under 45 years of age or within 10 years of earning a doctorate. Lisa was a recipient of the same award in 2012. 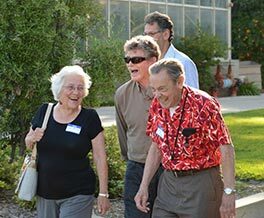 In 2007, Sharon became an ASPB Fellow, an honor granted in recognition of “distinguished and long-term contributions to plant biology and service to the Society.” She became a member of the Legacy Society in 2017. Beyond being celebrated researchers, Lisa and Sharon have been active members of the ASPB community. Sharon has been a member for 45 years and served as a co-editor of The Plant Cell from 2000 to 2001. 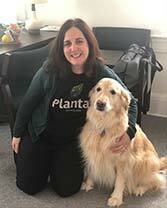 Lisa has been a member for 15 years and served on the Plant Physiology editorial board from 2011 until 2019, starting as a monitoring editor and eventually becoming an associate editor. In addition, Lisa has served on several governance committees. She was a member of the Executive Committee from 2012 to 2013, and as an elected member, she simultaneously served on the Board of Directors and Council from 2013 to 2016. Given their success, we asked both winners to share some of the insights from their journeys and the role that ASPB has played in their careers. Our questions and their responses follow. ASPB congratulates them both! Who are some of the critical mentors in your career? Lisa: I’ve been incredibly fortunate to have numerous terrific mentors for my whole career, from my undergraduate days at the University of California, Los Angeles, to my career with the USDA ARS and UIUC. Philip Rundel (emeritus professor at UCLA) taught courses in plant physiology and field ecology where I first learned gas exchange techniques to measure photosynthesis, and I used those techniques in Thailand. As an undergraduate, I also spent a summer as an NSF Research Experiences for Undergraduates student with Susan Singer (formerly of Carleton College, now provost at Rollins College). It was during that summer that I decided to pursue a PhD in plant sciences. From my graduate school days at UIUC to now, Steve Long and Don Ort have been incredibly generous mentors. They powerfully demonstrate the synergy of collaboration, and they graciously and generously promote their students and colleagues. In graduate school, I was fortunate to be surrounded by creative graduate students, postdocs, and mentors, including Alistair Rogers, Dawn Tucker, Carl Bernacchi, and Phil Davey. Early in my professional career, my graduate students Kelly Gillespie and Justin McGrath were critical mentors. They were patient as I navigated the challenges of starting a new lab, and Kelly demonstrated how to achieve work–life balance as a successful parent and scientist. The most important mentor in my career has been Andrew Leakey, who has provided critical comments, encouragement, advice, support, laughter, and patience when I needed it most. Sharon: My dissertation adviser, Ian Sussex, greatly influenced my sense of how to do science. He was original and thoughtful, a true scholar of plant development. I’m especially grateful for how he conveyed the importance of asking a central and important question in your research. The idea of approaching symbiosis as a developmental process originated in what I learned as Ian’s student. My postdoctoral adviser was Fred Ausubel, and he was amazing. Working with Fred was my first chance to do genetics, and he was a master at helping people learn to think and design experiments with genetics at the center. Fred also upheld and modeled best practices for being a good scientific colleague by sharing strains and results with others. I was truly lucky to work with these two great scientists. I also benefited from mentoring from and friendship with many others. For example, at Stanford I was helped and mentored by two senior leaders in our campus community, Winslow Briggs in the Carnegie Plant Biology Department and Charles Yanofsky in my home Department of Biology. Becoming an independent PI is complicated, challenging, and full of surprises, and having their perspectives was truly helpful. I also benefited from the collegial atmosphere in our department and across the campus community. Being at Stanford was a key to being able to work on both bacteria and plants. What impact has ASPB had on your career? Lisa: ASPB has provided opportunities to be part of a community, to serve that community, and to critically think about the role that societies play for professionals and scientists. At the annual meeting, which I’ve been attending since graduate school, ASPB provides opportunities to hear about cutting-edge research and to connect with scientists from near and far. Through Plant Physiology, I’ve had the honor of serving as an editor, and that has been an incredible opportunity to learn. I cannot overstate the positive impact ASPB has had on my career and the doors that being a member of the Society has opened. Sharon: ASPB is the first society I joined, back in 1974 when I first started graduate school. This is my 45th anniversary year! I have met many scientists at ASPB who gave me advice and helped me network. When I started working on plant signal transduction and plant cell biology, I benefited from ASPB contacts who worked on plant physiology and cell dynamics and who helped ask critical questions that kept our work on target. Over all these years, I have been so impressed with the friendliness and cohesion of the plant biology community. I feel I could call a colleague I know through ASPB and ask questions ranging from research techniques to teaching tips, and they would be welcoming and helpful. ASPB also has an excellent women’s group, and I learned a great deal about science and about life by participating in their workshops at ASPB meetings. That camaraderie was really helpful as I dealt with the challenges of being both a scientist and the mother of young children! ASPB offers a fond farewell to Melanie Binder, who recently moved on to a new position with the Healthcare Financial Management Association. Melanie began working with ASPB in 2013 and was a critical part of launching Plantae, an award-winning global online community for plant scientists, students, and related professionals. As the Plantae community engagement manager, she developed new digital products and programs, grew the community, coordinated educational series, and produced the award-winning podcast, the TapRoot. Melanie and CSO Bailey Binder (Chief Snuggle Officer). Melanie also advanced ASPB membership and enjoyed connecting with members at ASPB sections meetings, Plant Biology, and Phenome meetings. Melanie has been a great colleague and friend, and we wish her the best of luck in her future endeavors. Join us online to wish Melanie farewell (see http://bit.ly/2NYcyXk)! ASPB members share a common goal of promoting the growth, development, and outreach of plant biology as a pure and applied science. 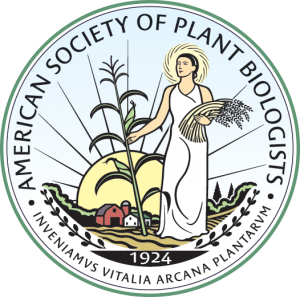 This column features some of the dedicated and innovative members of ASPB who believe that membership in our Society is crucial to the future of plant biology. If you are interested in contributing to this feature, please contact ASPB Membership at info@aspb.org. 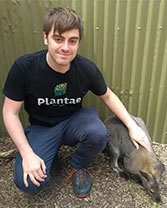 ASPB Ambassador, Lucas Vanhaelewyn, spreading Plantae in Australia. What would you tell colleagues to encourage them to join ASPB? ASPB is a very diverse plant science community. It inspires scientists to think outside the box and enriches both your professional and personal life in many unexpected ways. The Plant Biology meetings offer interesting workshops and high-quality symposia, as well as plentiful opportunities for building a solid network. Joining ASPB has been a boost for my professional development. Not to forget, the annual meeting is organized in different and attractive locations, so you get to visit awesome places, such as Hawaii, and Niagara Falls, when the meeting was in Montreal. Was someone instrumental in getting you to join ASPB? Yes, both of my PIs, Filip Vandenbussche and Dominique Van Der Straeten, have been very supportive of my professional development. They entrusted me with representing our research group abroad in Hawaii and other places, something I am and always will be grateful for. Have you enhanced your career, lab, research, or education using ASPB, the Plant Biology meeting, section meetings, Plantae.org, The Plant Cell, Plant Physiology, or Plant Direct? I joined ASPB during the first year of my PhD. Both ASPB and Plantae.org have greatly enhanced my professional development in terms of exposure, networking, and confidence building. ASPB is devoted to young scientist development; for me personally, the ASPB Conviron Scholars program was an enjoyable way to grow as a scientist and to meet wonderful friends, experts, and peers without borders. Two of my fellow ASPB Conviron Scholars have already found their way to Ghent for a visit. In addition, I found support within ASPB for my latest publication, and we made some nice connections with like-minded scientists. There is an amazing team working behind the scenes at ASPB and Plantae. I would recommend that any (young) plant scientist join ASPB and consider volunteering at one of the meetings—it is a fun way to learn while getting connected. I wouldn’t be a plant scientist if my hobby wasn’t plants. My passion lies in applying my plant knowledge in the real world, especially for capacity building in developing countries. It began with my consultant role offering advice to an agricultural company named NASECO Seeds in Uganda. Later, I initiated an ambitious collaboration with Ssemu Agrotech Consultants, also in Uganda. The main goal of our collaboration was to translate our plant and agricultural knowledge into useful applications and products that could benefit rural farmers. We generated and delivered nearly 1.8 million high-quality grafted mango seedlings (Tommy Atkins, Kent, Palvin, Zillate, and Apple Mango) and orange seedlings (Valencia and Washington navel) to the government, which in turn distributed these plant materials freely to rural farmers in an effort to improve wealth and public health. At the moment we are advancing in value addition, aiming at the local production of fruit juices and dried fruits. It is a challenging and fulfilling way of spending my spare time. In the near future, my fiancée, who has a PhD in agricultural economics, and I would like to engage in similar projects in Asia, starting with my potato consultancy project in Vietnam for the upcoming PhD bootcamp, supported by belgapom. As the years churn on, many esteemed members of ASPB have passed the torch to their younger colleagues and stepped out of the limelight to allow others to bask in its glory. Yet, many continue their good works to the benefit of plant biology and the world. Edited by Rebecca Dickstein, University of North Texas, “Where Are They Now?” is part of the ASPB News suite of columns focused on the personal and scientific life and insights of ASPB members at all stages of their career. This column offers a look into the current activities of influential members of ASPB who continue to make a positive mark on our Society. We hope you all enjoy this addition to your newsletter. Please feel free to submit your own article to “Luminaries,” “Membership Corner,” or “Where Are They Now?” For details, contact Jill Deikman, Membership Committee chair, at jill.deikman@monsanto.com. As always, we are open to suggestions for articles or features of interest to readers of the ASPB News. Recently, I wrote about how the upheavals surrounding the Vietnam War influenced me to become a plant biologist and led me to use Arabidopsis thaliana to study host–pathogen interactions (Ausubel, 2018). Here, I will elaborate on some of my lab’s early work on Arabidopsis and what influenced me later to extend our work on host–pathogen interactions to using the nematode Caenorhabditis elegans as a model host. In 1972, after receiving my PhD in lambda phage molecular biology, I switched fields in order to do “science for the people,” which in my case was to attempt to transfer functional bacterial nitrogen fixation (nif) genes to plants. If a crop like maize could fix nitrogen, it would reduce use of nitrogen fertilizers, thereby saving tremendous amounts of energy and decreasing deleterious nitrogen fertilizer runoff. In 1975, when I started as an assistant professor at Harvard, I framed our work on the nif genes by emphasizing the long-term agricultural applications. In fact, however, the actual work focused on the genetic characterization of nif gene clusters in Klebsiella pneumonaie and Sinorhizobium meliloti. This created a career dilemma: I was hired as a plant biologist, not a microbiologist, even though I was not trained as a plant biologist. I studied chemistry in college and took hardly any biology classes. Teaching plant physiology was difficult, to say the least. Moreover, I believed that to be promoted, I needed to change the focus of the lab from bacterial genetics to a study of the S. meliloti–alfalfa symbiosis. Fortunately, Sharon Long, one of my early postdoctoral fellows, figured out how to clone S. meliloti nodulation (nod) genes required to elicit the formation of root nodules (Long et al., 1982). While these changes in research emphasis were taking place, in 1982 Howard Goodman recruited me to a tenured position in the newly created Department of Genetics at Harvard Medical School and the Department of Molecular Biology at Massachusetts General Hospital (MGH). I would probably have continued to work on the Rhizobium–legume symbiosis had I not attended a Gordon Research Conference in 1984 and heard Christopher Somerville talk about the isolation of Arabidopsis photosynthetic mutants. At that time, I was becoming frustrated with the S. meliloti–alfalfa model system because alfalfa genetic analysis was impractical. I was toying with the idea of switching to a different legume host, but I had also been intrigued with Arabidopsis as a potential plant model system since my graduate school days. Indeed, in 1975 when I started my job at Harvard, Arabidopsis was my plant of choice as the recipient of bacterial nif genes. However, with the exception of a few months in 1973 when I was a postdoc, I had not worked with Arabidopsis. As I wrote earlier (Ausubel, 2018), I decided at the Gordon conference to start switching the lab to Arabidopsis, even calling the lab to announce this plan. Two other key events prompted my switch to Arabidopsis in 1984. First was the discovery in Elliot Meyerowitz’s lab that Arabidopsis had the smallest genome of any known plant (Leutwiler et al., 1984). Second, Gerald Fink, the renowned yeast geneticist at the Massachusetts Institute of Technology, was beginning to develop an Arabidopsis project. In 1984, with a secure position and ample funding from the Department of Molecular Biology at MGH, I was able to initiate the switch to Arabidopsis. My initial instinct was to focus on pathogenesis in Arabidopsis. Having no training in plant pathology, however, was a hindrance. It was not immediately obvious to me that the holy grail in the plant pathology field was to clone plant resistance genes, even though Arabidopsis was ideally suited to achieve this goal. Another issue was that there were no well-studied Arabidopsis pathogens, especially bacterial pathogens. Fortunately, Brian Staskawicz at the University of California, Berkeley, clued me in about plant pathology, and Eric Schott, a graduate student in the lab, undertook the task of identifying a suitable “model” Arabidopsis pathogen. We settled on Pseudomonas syringae pv. maculicola (strain ES4326, named after Eric), our pathogen of choice for many years, allowing us to identify Arabidopsis mutants that were more susceptible to ES4326 by forward genetics and ultimately to clone an Arabidopsis nucleotide-binding site leucine-rich repeat (NBS-LRR) resistance gene (Mindrinos et al., 1994). A game changer was Laurence Rahme joining my lab as a postdoctoral fellow in 1991. When she was a graduate student in Nick Panopoulos’s lab, Lory read about experiments tracing the hospital reservoir of Pseudomonas aeruginosa nosocomial infections to plants, including potted plants that were brought as presents to patients. P. aeruginosa, an opportunistic human pathogen, is a ubiquitous soil microbe but was not known as a bona fide plant pathogen. Lory systematically tested a set of P. aeruginosa strains for their ability to cause disease symptoms in infiltrated Arabidopsis Col-0 leaves. Several proved to be infectious, multiplying in a leaf similarly to P. syringae ES4326. Several P. aeruginosa strains, including PA14 isolated from a human burn patient, were highly virulent in both Arabidopsis leaves and a mouse thermal injury model. Lory reasoned that PA14 could be used to identify P. aeruginosa virulence factors that are generally required for pathogenesis, independent of host (Rahme et al., 1995). The ability of a single strain of P. aeruginosa to function as a multihost pathogen was interesting for several reasons, a major one being that we worked at a hospital and P. aeruginosa is a naturally multidrug-resistant human pathogen. For years, colleagues at MGH would ask, “Why are you studying plants at a hospital?” With PA14, I no longer needed to talk in generalities about evolutionary conservation and the unity of life but could say directly that we were working on an important human pathogen that causes high morbidity and mortality among immunocompromised and cystic fibrosis patients. About 1995, another game changer occurred when graduate student Man-Wah Tan, who was working with Lory on identifying PA14 mutants that were less virulent in plants, gave a talk at our weekly internal departmental seminar. My colleague (and former graduate student) Gary Ruvkun asked whether we had tested other potential hosts for susceptibility to PA14. We had already thought about this because it seemed unlikely that PA14 is infectious in only two broad families of potential hosts, plants and mammals. We had thought about testing Drosophila, but that is somewhat daunting because Drosophila can be fussy to raise in the lab. Gary’s lab, however, worked with C. elegans, which feed on E. coli on petri plates and are easy to work with. A week after Gary had asked the question, Man-Wah had the result. When he transferred C. elegans animals from a lawn of E. coli strain OP50 to a lawn of P. aeruginosa PA14, the nematodes were quickly killed by PA14. Moreover, some of the same PA14 virulence factors that are required for virulence in mice and Arabidopsis were also required for PA14-mediated killing of C. elegans (Tan, Mahajan-Miklos, et al., 1999; Tan, Rahme, et al., 1999). Man-Wah’s establishment of a C. elegans–PA14 pathogenesis model began a gradual shift of focus from plant–pathogen to nematode–pathogen interactions. At first, I thought that the plant and worm projects would be synergistic because neither plants nor worms have mobile immune cells, and therefore each plant or worm cell is primarily responsible for its own defense. Furthermore, both Arabidopsis and C. elegans are self-fertilizing hermaphrodites, and genetic analysis is conceptually very similar in the two species. I submitted an NIH R01 proposal that contained both plant and C. elegans experiments and argued for synergy between the systems, and it was funded. In fact, however, it appears that the plant and animal innate immune responses evolved in parallel and that the C. elegans immune response is more similar to the innate immune systems in insects and vertebrates than it is to the plant immune response (Kim et al., 2002). The C. elegans infection model has particular experimental advantages in comparison to the Arabidopsis infection model that affected the course of research in my lab over the past 20 years. First, because C. elegans is naturally bacterivorous, it is straightforward to infect worms with a bacterial pathogen. Worms ingest most bacterial species, and pathogenic bacteria can go on to establish an intestinal infection. Second, C. elegans adults are less than a millimeter long, and 15 or more of them easily fit in the well of a standard 384-well assay plate. This allows high throughput screening of chemical or RNAi libraries for compounds or RNAi clones that alter susceptibility of the worms to pathogen-mediated killing (Moy et al., 2009). These advantages, as well as the fact that C. elegans is an animal and not a plant, made it easier to fund C. elegans than Arabidopsis projects, resulting ​in the gradual increase in C. elegans-​related and decrease in Arabidopsis-related projects in the lab. One of the downsides of the C. elegans project’s success was that I felt estranged from former plant colleagues because I went to fewer plant meetings. At the same time, I never really integrated myself into the C. elegans community, and I am somewhat embarrassed to say that I have never been to a C. elegans meeting. Scientists are largely defined by their fields of study or the model genetic organisms with which they work. After my work with C. elegans, my “field” of study became the somewhat amorphous field of host–microbe interactions in general, rather than C. elegans or Arabidopsis pathogenesis in particular. Most recently, I have become interested in translational aspects of the C. elegans pathogenesis model and the pursuit of novel antimicrobial therapeutics, as well as therapies that can be developed based on conserved features of the C. elegans innate immune response to pathogen attack. Practically, this means that my new fields of study are the rise of microbial resistance to antimicrobial therapies and inflammatory bowel disease. This is not very close to where I started my career as a plant biologist, but the circuitous pathway to where I wound up is not completely arbitrary and, to me, makes sense. Ausubel, F. M. (2018). Tracing my roots: How I became a plant biologist. Annual Review of Genetics 52: 1–20. Kim, D. H., Feinbaum, R., Alloing, G., Emerson, F. E., Garsin, D. A., Inoue, H., Tanaka-Hino, M., Hisamoto, N., Matsumoto, K., Tan, M. W., and Ausubel, F. M. (2002). A conserved p38 MAP kinase pathway in Caenorhabditis elegans innate immunity. Science 297: 623–626. Leutwiler, L. S., Hough-Evans, B. R., and Meyerowitz, E. M. (1984). The DNA of Arabidopsis thaliana. Molecular and General Genetics 194: 15–23. Long, S. R., Buikema, W. J., and Ausubel, F. M. (1982). Cloning of Rhizobium meliloti nodulation genes by direct complementation. Nature 298: 485–488. Mindrinos, M., Katagiri, F., Yu, G. L., and Ausubel, F. M. (1994). The A. thaliana disease resistance gene RPS2 encodes a protein containing a nucleotide-binding site and leucine-rich repeats. Cell 78: 1089–1099. Moy, T. I., Conery, A. L., Larkins-Ford, J., Wu, G., Mazitschek, R., Casadei, G., Lewis, K., Carpenter, A. E., and Ausubel, F. M. (2009). High-throughput screen for novel antimicrobials using a whole animal infection model. ACS Chemical Biology 4: 527–533. Rahme, L. G., Stevens, E. J., Wolfort, S. F., Shao, J., Tompkins, R. G., and Ausubel, F. M. (1995). Common virulence factors for bacterial pathogenicity in plants and animals. Science 268: 1899–1902. Tan, M. W., Mahajan-Miklos, S., and Ausubel, F. M. (1999). Killing of Caenorhabditis elegans by Pseudomonas aeruginosa used to model mammalian bacterial pathogenesis. Proceedings of the National Academy of Sciences USA 96: 715–720. Tan, M. W., Rahme, L. G., Sternberg, J. A., Tompkins, R. G., and Ausubel, F. M. (1999). Pseudomonas aeruginosa killing of Caenorhabditis elegans used to identify P. aeruginosa virulence factors. Proceedings of the National Academy of Sciences USA 96: 2408–2413. The information in this article was accurate at the time of writing. USDA was expected to announce a short list in January with final site selections for the relocation of the National Institute of Food and Agriculture (NIFA) and the Economic Research Service (ERS). However, at the time of this writing, no announcement had been made on the move. On January 25, President Trump agreed to reopen NSF, USDA, and other federal research agencies through February 15 to enable negotiations on a larger border security and immigration compromise, ending the 35-day partial government shutdown. Given the shutdown’s unprecedented length, there is a great deal of uncertainty as to how federal agencies such as NSF will recover from this significant disruption and what the residual effects on U.S. research and higher education will be. NSF: Research and Related Activities would receive a 3% increase above FY2018. The minibus and accompanying information can be found at https://tinyurl.com/yytbqwjb. On January 2, as one of the final acts of the 115th Congress, the Senate confirmed a series of science and environmental nominees, including Kelvin Droegemeier to be director of the White House Office of Science and Technology Policy (OSTP). Droegemeier’s confirmation means the administration will have someone filling the top-level science adviser position in the White House for the first time in close to two years. In response to Congress’s failure to confirm three nominees to USDA, Secretary of Agriculture Sonny Perdue chose to name Mindy Brashears as deputy undersecretary for Food Safety, Naomi Earp as deputy assistant secretary for Civil Rights, and Scott Hutchins as deputy undersecretary for Research, Education, and Economics. On a procedural level, this move circumvents the necessity for Senate confirmation while allowing Secretary Perdue to quickly install nominees to vacant posts at the agency. All three were favorably reported by the Agricultural Committee. ASPB was heavily involved in the community effort to support the confirmation of both Droegemeier and Hutchins. A list of all the confirmed nominees is available at https://tinyurl.com/yb3rate3. USDA’s press release announcing the appointment of Hutchins and others can be found at https://tinyurl.com/yb49qgr4. As the 116th Congress began its first session, committee and subcommittee assignments were being finalized in the House and the Senate. With Democrats reclaiming the majority in the House, new committee leaders with jurisdiction over NSF, USDA, and other federal science agencies were rebranding and setting agendas. It appeared that the Democrats will use these committees to advance a national agenda on climate change. As part of the new House rules, the Democrats created a new congressional committee focused on climate change. The Select Committee on the Climate Crisis, a new iteration of the former Select Committee on Energy Independence and Global Warming (2007–2011), will be chaired by Rep. Kathy Castor (D-FL) to hold hearings and implement investigations. Although lacking the full authority of other congressional committees, the Select Committee is a mechanism for Democrats to profile climate change as a priority issue. In the House Energy and Commerce Committee, Chairman Frank Pallone (D-NJ) appointed Rep. Paul Tonko (D-NY) to chair the Environment and Climate Change Subcommittee. In his press release announcing the assignment, Tonko expressed his intention to leverage the oversight authority of the subcommittee to address the economic and public health concerns of climate change. Rep. Tonko hit the ground running, and the Energy and Commerce Committee has already scheduled a climate change hearing, the first such hearing in six years. Chairman Pallone also tapped Rep. Diana DeGette (D-CO) to chair the Oversight and Investigations Subcommittee. In her announcement of the appointment, Rep. DeGette expressed that her top priority is to “make sure that science and widely accepted scientific facts are once again used as the basis for any and all of the important decisions.” She concluded, “No longer are we going to allow these agencies to ignore, among other things, the very real effects of climate change.” To support her in this work, Rep. DeGette appointed Manik Roy, a scientist with 35 years of policy experience advising lawmakers, government, and corporate leadership on climate change, as her climate change and environment policy director. This whole-of-committee emphasis on oversight and evidence-based policy as it pertains to issues such as climate change is likely indicative of future subpoenas for top officials as well as regulatory agendas focused on environmental protection, such as curtailing Environmental Protection Agency regulatory rollbacks. A summary of the rules package can be found at https://tinyurl.com/yb52rtl2. Rep. Paul Tonko’s press release can be found at https://tinyurl.com/ycz3sww4. The announcement of the House Oversight and Reform members can be found at https://tinyurl.com/y9uo8zqe. Rep. Diana DeGette’s subcommittee announcement can be found at https://tinyurl.com/yb2blntw. Rep. Diana DeGette’s announcement of hiring Manik Roy can be found at https://tinyurl.com/y9m8s8qs. Rep. Harley Rouda’s press release can be found at https://tinyurl.com/y93rjynf. The Energy and Commerce Committee roster can be found at https://tinyurl.com/y6vxvz38. Rep. Eddie Bernice Johnson’s interview with the American Geophysical Union’s Eos can be found at https://tinyurl.com/ycsrjkwn. Rep. Haley Stevens’s press release can be found at https://tinyurl.com/y8xnmssk. Although Republicans maintained their majority in the Senate, there were some shifts in committee jurisdiction and leadership. On the Senate Commerce, Science, and Transportation Committee, Sen. Roger Wicker (R-MS) was named chair as former chair Sen. John Thune (R-SD) took over as majority whip. The Senate Commerce Committee is the bicameral counterpart to the House Science Committee and has jurisdiction over NSF. Chairman Wicker has reorganized much of the committee, relocating the science portfolio from the Science, Space, and Competitiveness Subcommittee, now Space and Aviation, to the Science, Oceans, Fisheries, and Weather Subcommittee chaired by Sen. Cory Gardner (R-CO). This reorganized committee will now oversee NSF, the National Institute of Standards and Technology, the White House OSTP, and the National Oceanic and Atmospheric Administration. The Senate Commerce, Science, and Transportation Committee subcommittee chairs and descriptions can be found at https://tinyurl.com/yadx9gc5. As of this writing, NEON had completed all but one site of its 81-site network and was continuing to shift its focus from construction to operations. The vision is for NEON to play a pivotal role in monitoring ecosystem shifts and climate change indicators across a number of ecological disciplines. The letter from STEAC members can be found at https://tinyurl.com/y72yj9yq. More information can be found at https://tinyurl.com/yceu8mhq. Plant biology is finding renewed emphasis from the realization that this discipline will likely be responsible for many of the leaps in crop productivity needed to feed a growing global population. Whether it’s fixing a metabolic glitch that restricts photosynthesis or finding ways for nonlegumes to reduce atmospheric nitrogen, plant biology is addressing many of our most complex challenges. Dr. Angle engaging NIFA stakeholders. Photo courtesy of J. Scott Angle. I spent the past three years as CEO and president of the International Fertilizer Development Center (IFDC). As an international public organization, IFDC has helped smallholder farmers in some of the poorest countries in the world grow food with higher yield and enhanced nutrition, and then has helped market that food to improve the lives of these farmers. Much of the work in Asia focused on Bangladesh, where I spent considerable time. Many of you will remember that Bangladesh was once a country unable to feed itself, and many thousands died of famine when natural or political disasters struck. Today, Bangladesh feeds itself and exports food to other areas of the world. No other country has made so much progress in such a short time. This amazing turnaround came from the recognition that a free economy guided by sound and true science and policy can be a powerful force for problem solving. Bangladeshi leaders invested in both the applied as well as the basic sciences, believing that the country’s needs are both short and long term. My hat is off to Bangladeshi leaders, past and present, who recognize that science can both push and pull a country forward. 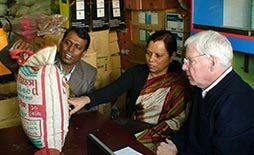 The National Institute of Food and Agriculture (NIFA) was created to do exactly what has worked so well in Bangladesh. NIFA’s goals are to support research, education, and extension efforts in a wide range of scientific fields related to agricultural and behavioral sciences. In all of these areas, you will find NIFA working in pursuit of our vision. We seek to catalyze transformative discoveries and enhance education and engagement in order to address contemporary agricultural challenges. A unique aspect of NIFA is that we engage with our stakeholders more than most other funding agencies. Many of our competitive programs have farmers, ranchers, community nutritionists, and others who sit on our panels to ensure relevance to societal needs. These panel members have an equal vote as they sit next to scientists during the review process. Keep this in mind as you consider submitting proposals to NIFA. Relevance to the user community is an important consideration during the review process. This emphasis on relevance does not preclude the submission of proposals that focus on the basic sciences. Indeed, much of the work we support under the Agriculture and Food Research Initiative (AFRI) is fundamental and basic. However, what distinguishes NIFA from other funding agencies is that you must show how that basic research will ultimately translate and benefit the community—perhaps not directly in the research you are proposing, but you must show how the work will ultimately lead to user benefits. For example, how will a farmer increase yields or lower input costs, how will the nutrition of families improve, or how will environmental quality improve as a result of the research you are proposing? Enhancing farmer income is a particular focus of Agriculture Secretary Sonny Perdue. We all understand that many of the stresses rural communities face today are the result of declining farm income, which affects entire rural communities. Good science can help alleviate some of this stress. A research project at Cornell University is a good example of how NIFA-funded science can make a difference. Two Cornell University scientists are working with wheat in a way that may both improve crop yield and increase the amount of productive land farmers have to work with. Olena Vatamaniuk and Mark Sorrells are studying the physiological, molecular, and genetic mechanisms of how plants process the micronutrient copper. It’s known that a deficiency in copper compromises crop fertility and reduces grain and seed yield; what’s not well known is how copper uptake and internal transport are achieved and regulated, or how copper impacts wheat fertility. Previous studies of Arabidopsis thaliana indicate that two proteins play a major role in copper uptake, delivery, and plant fertility. Vatamaniuk, an associate professor of soil and crop sciences, and Sorrells, a professor of plant breeding and genetics, are using their interdisciplinary approaches to understand these proteins and how they affect copper transport pathways in wheat. The team is using cutting-edge equipment. CRISPR/CAS9 technology is being used to understand the function of SPL7 pathway in wheat. An advanced particle accelerator, synchrotron X-ray fluorescence imaging, is being used to visualize copper distribution. RNA sequencing and quantitative trait locus mapping are being used to identify copper deficiency and SPL7-regulated genes and regions of the chromosome associated with improved copper movement to wheat reproductive organs and grain yield. If successful, this research could improve grain yield of soils currently in cultivation and allow farmers to plant high-yield crops on marginal lands previously deemed unsuitable for farming. It may even help feed the world. NIFA is supporting this research with an AFRI grant (https://tinyurl.com/yxkhnjpp). I look forward to hearing from the plant biology community. Your thoughts, ideas, and goals can help drive the NIFA research agenda. Research funding is never enough to support all of the good work proposed; NIFA needs to focus our resources on the areas in greatest need of funding. You can play a role in helping NIFA make the greatest impact possible. ASPB’s Transforming Education in Plant Biology (TEPB) program provides financial support for plant science educators to participate in focused, substantive, and practical professional development. Awardees use this professional development to create new instructional materials in plant biology that align with ASPB’s core concepts in plant biology. TEPB is particularly well suited to faculty who are planning to build or revise courses or curricula to incorporate evidence-based methods of teaching and learning. Meet the 2019 recipient, Mary Heskell. I’m a plant ecophysiologist and an assistant professor at Macalester College in Saint Paul, Minnesota. My research focuses on the environmental and biological controls of forest and tundra plant carbon cycling at the leaf level. As a new faculty member in the Biology Department at Macalester, I am in the process of revamping an introductory ecology course to more explicitly integrate the impacts of climate change and human development. As the only actively teaching plant biologist in the department, I also see this as a crucial opportunity to emphasize the role of plants and other photosynthetic organisms in primary production and climate regulation. I hope to convey the “magic” and immeasurable importance of Rubisco to students who might not be exposed to plant biology in other courses. As the recipient of the Transforming Education in Plant Biology award, I plan to attend a Summer Institute on Scientific Teaching to develop teaching materials (a “teachable tidbit”) to share with the greater ASPB community. The Summer Institutes emphasize evidence-based teaching practices, active learning, effective assessment, and inclusive teaching, with the goal of helping higher-ed educators create products that will enhance student learning in their respective content fields. As a plant ecophysiologist whose research spans cells to ecosystems, I approach teaching photosynthesis both as an assemblage of intricate biochemical pathways and as a global transformation of energy that is observable from space. The Summer Institute workshop will allow me to effectively teach photosynthesis for understanding beyond a simplified equation and to help students recognize its fundamental and global importance to life on Earth. The fifth international Fascination of Plants Day 2019 will take place May 18, 2019. The goal of this special day is to get as many people as possible around the world fascinated by plants and enthused about the importance of plant science for agriculture and sustainable production of nutritious food, as well as for horticulture, forestry, and plant-based nonfood products such as paper, timber, chemicals, energy, and pharmaceuticals. The role of plants in environmental conservation is another key message. We invite everyone, from schools to scientists, from media to policy makers, to join in and contribute to this initiative. For ideas about potential outreach activities, check out the 2017 success stories (http://bit.ly/FoPDSuccessStories). We invite you to organize an attractive, plant-related activity and to interact with the public. Events can be organized throughout the month of May. If you plan on hosting an outreach activity, tell us about it at plantday@aspb.org. Reprinted from Molecular Plant (April 2019), Volume 12(4): 461–463 (https://doi.org/10.1016/j.molp.2019.02.007), with permission from Elsevier. We are deeply saddened that our beloved and respected friend and colleague Professor and Director Emeritus Winslow Briggs passed away peacefully on February 11, 2019, at the age of 90. Winslow Briggs was a giant in the field of plant biology, an inspiring mentor, and a treasured colleague. He was also a beloved husband, father, and friend. We shall miss him dearly. Winslow and Ann Briggs volunteered for nearly 40 years at the Henry W. Coe State Park. Winslow was born on April 29, 1928, in Saint Paul, Minnesota. He started his professional careers as a faculty member at Stanford University’s Biology Department in1955. In 1967, he returned to his alma mater, Harvard University, as Professor of Biology. In 1973, he became the Director of the Department of Plant Biology at the Carnegie Institution for Science. He retired from that position in 1993. Subsequently, he continued to conduct ground-breaking research at Carnegie, including the discovery of the phototropin receptors, and remained active in research and extremely influential in science until the very last day of his life. As a young researcher, Winslow set out on a quest to understand how light changes plant growth and development. In the early decades of his career, Winslow’s research explored broad aspects of photomorphogenesis, including the red and far-red light photoreceptor, phytochrome; the roles of phytohormones in light-dependent development; and the mechanisms of phototropism. Among many seminal findings, his experiments confirmed that phototropic stem bending involves the transport of auxin from the lighted side of a stem to the shaded side. Many of the research programs initiated in his lab were continued later by his students and postdocs in their own labs, but phototropism remained a focus of his own work. Although he searched arduously for the blue light receptor that mediates phototropic responses, he only found success after his retirement. Following years of biochemical pursuit, his group adopted a genetic approach and isolated the Arabidopsis nonphototropic hypocotyl 1 (nph1) mutant. This mutant led to the cloning of the gene for phototropin, the blue light receptor that mediates phototropism. This breakthrough was followed by studies that unraveled the biochemical mechanisms of blue light perception by LOV-domain-containing photoreceptors and uncovered phototropin functions in a wide range of plant light responses, including stomatal opening and chloroplast relocation. Along with colleagues, he made the surprising discovery that similar receptors are also found outside the plant kingdom, some of which are implicated in the light-dependent virulence of bacterial pathogens such as Brucella that cause infectious diseases in animals. At the age of 90, he discovered that light, acting through the LOV-domain proteins in Rhizobium, has a major effect on the symbiotic relationship between the nitrogen-fixing bacterium and legume plants. When he died, he was in the middle of conducting field tests and very excited about the potential impact this discovery could have in agriculture. Over the course of his long career, he made many seminal contributions to our understanding of the physiological, biochemical, and molecular mechanisms underlying plant growth and responses to the environment. He was one of the most-admired plant scientists of modern times, known for his fearlessness, stamina, and love of a well-designed experiment. He re-invented himself several times during his long career, from physiologist, to biochemist, to geneticist, to molecular biologist, while he remained at the cutting edge until the end of his life. And, through it all, he was always respectful and generous to his colleagues. As director, Winslow transformed Carnegie’s Department of Plant Biology by doubling its research facilities, hiring several faculty members with new areas of expertise, and welcoming numerous graduate students and postdoctoral fellows from all over the world to conduct their research at Carnegie. Photosynthesis and ecophysiology were longstanding areas of excellence at Carnegie, which he continued to foster. In addition, he built bridges between the two by emphasizing a third branch of research, plant development. His vision for plant biology research at Carnegie was well articulated in his inaugural comments in the 1973 Carnegie Year Book: “Adaptation to a stressful environment … can only be understood through a study of mechanisms throughout the life history of a plant. … Physiological adaptations to stress have an evolutionary history. Photosynthetic mechanisms have an evolutionary history. Developmental patterns have an evolutionary history. An understanding of this history and the mechanisms underlying it is yet another parameter one must include for a reasonable comprehension of the ways in which plants grow, adapt, and photosynthesize.” His vision continues to guide the department’s scientific endeavors to this day. Winslow inspired multiple generations of scientists as a mentor, a role model, and an enthusiastic proponent of biological research. He initiated a fellowship that enabled Stanford graduate students to conduct research at Carnegie. He was an extremely generous and open director, welcoming scientists and students from all over the world to visit and train at Carnegie, helping them to develop their own research careers. In addition to advising Ph.D. students in his lab, Winslow served on thesis committees for many others and always treated graduate students with respect. His optimistic approach was both inspiring and practical for many. Winslow was also an exceptional naturalist and keen observer of natural phenomena. He and his wife, Ann, volunteered for nearly 40 years at the Henry W. Coe State Park, about which he published a book of trails. His license plate read “HIKE COE.” Winslow and Ann also served on the board of the Pine Ridge Association and, in 1999, won the Dewitt award for “partnership” from the State of California. In 2013, Winslow was awarded the Philanthropist of the Year by the California State Assembly for his work in helping to save Coe Park from imminent closure. When fire ravaged the park in 2007, Winslow saw an opportunity to study how plant seeds germinate after vegetation has been destroyed. In order to fully document the phenomenon, he enlisted volunteers to map vegetation regrowth (https://coefire.com). He “cooked” closed Bishop pine cones in the oven to demonstrate that they pop open after high heat to release their seeds. This new research avenue, which Winslow initiated at age 80, ultimately led to the discovery that the slow release of cyanide from glyceryl nitrile in the smoke from a wildfire may play a role in accelerating post-fire sprouting and flowering of plants that usually remain dormant. Winslow was a renaissance man with many talents. In his youth, he was an avid mountaineer who climbed some of the world’s highest peaks, including Denali. He was an accomplished musician and trained as a concert pianist at Harvard at the same time as he pursued his biology degree. He was also an expert at Chinese cooking, including his specialty of Peking Duck. He always made time to host his lab members and colleagues at his home, serving us excellent homemade meals and treating us to piano recitals. Winslow shared his favorite dishes such as sesame noodles and sweet-sour cabbage at the department’s Lunar New Year parties, including the one that occurred just a week before his death. Winslow also took beautiful landscape photographs and held several art exhibits in the lobby of the department’s building on the Stanford Campus. Some of his recent photos from the Anza-Borrego Desert are part of the building’s permanent art display. Winslow was a consummate scientist who was passionate about many other aspects of life including family, treks in the mountains, music, food, and art. Winslow was a model citizen in the communities to which he belonged. He attended and presented posters at the ASPB meeting every year from 1953 through 2018. For decades, he spent his weekends volunteering at the Henry W. Coe State Park. He remained an active member of the department until the end of his life, attending faculty meetings and meeting with seminar speakers just a few days before his death. During the last hours of his life, Winslow checked his bean plants in the greenhouse, emailed a manuscript to his lab members, and responded to an email that requested a volunteer to meet with a local science reporter. It has been a privilege for us to have our lives enriched by Winslow. While his passing is devastating for all of us, we take comfort in the knowledge that Winslow lived a full life—doing what he loved until the very end—and that his philosophy and spirit will continue to inspire us and live on through us. I am Zhiyong Wang, the acting director of Department of Plant Biology, Carnegie Institution for Science. I am also Winslow’s academic grandson. You can find my name on the family tree at the entrance. What a thrill to work with my grandfather. However, I never felt that I was treated like a grandson. He treated everyone equally. I would like to give my sincere condolences to Winslow’s family, and also thank them for giving me this opportunity to express my respect and gratitude to Winslow. 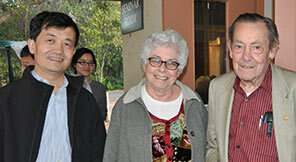 Zhiyong Wang (left) and Elaine Tobin with Winslow at his 86th birthday symposium. Winslow was one of the most respected plant biologists of modern time. In the last two weeks, numerous messages and articles about Winslow were posted on the internet and many sent to me by email. Reading these messages and emails made me think again and again how lucky we are at Carnegie to have had the opportunity to work alongside Winslow, a true giant in our field and a perfect role model at every level. The faculty of our department, together with several other colleagues, also wrote a tribute to Winslow and published it in Molecular Plant, a journal that Winslow helped to get started. Now it’s one of the top journals in our field. Many of you have a copy of the paper in your hand. I hope you enjoy reading it. But Winslow’s career and life are much richer than we can describe in a paper. So, I have been thinking more about Winslow, and trying to come closer to an accurate appreciation of how much Winslow really means to all of us, and to the world. I like the title of our paper: “In Memory of Winslow Briggs, a Luminary Who Shed Light on Plants and Enlightened People.” That’s a plain and simple statement of a spectacular life. Indeed, Winslow illustrated scientifically how a plant maximizes its growth by seeking light. More importantly, he also demonstrated personally how a human being can maximize his or her value by serving others. Winslow was not only a productive researcher, but also an extremely fruitful mentor and teacher. As you can see from the partial family tree, Winslow trained more than a hundred students, postdocs, and visiting scientists. His contributions to science go way beyond the 300-plus papers he authored. He is a giant on whose shoulders many scientists stand. What is invisible on the family tree, but more valuable, is the family culture that Winslow cultivated—culture of respect, encouragement, and giving. Winslow’s discoveries and contributions will be remembered by the scientific world, but for those of us at Carnegie, what we will miss the most are his love of science and his generous giving heart. Winslow loved many people and many things. Based on the amount of time he spent with them, I can say that his top two loves were his wife, Ann, and science. He was excited about his research until the very end of his life. It’s legendary that his most important discovery was made after his retirement, and his discovery that has the largest potential impact on agriculture was made near the end of his record long career. Winslow’s discovery of light’s effect on nitrogen fixation is on its way to commercialization. As I have heard from several of our postdocs who saw Winslow working in the greenhouse over the weekends and holidays, Winslow’s love of science is truly inspiring. Of course, we all know what a wonderful husband and father Winslow was. In recent years, Winslow became a care giver, as Ann became more dependent on him. He was often torn between his two loves, though he was able to come to work every day. Winslow actually cared for everyone around him. A week before his passing, we had a Lunar New Year lunch party in the department. Winslow changed his doctor’s appointment in order to prepare his favorite sesame noodles and sweet-sour cabbage at the party. Winslow also cared very much about the department and the institution. He was one of the most consistent attendees of faculty meetings. On Monday February 11, I was having a meeting with a few team members in my office, and Winslow showed up at the door, and asked, “Don’t we have a faculty meeting today?” I said, “I don’t think so; we just had one last Friday.” He said, “Oh, well, I don’t want to bother you anymore,” and went back to his office. About half an hour later, I heard the call that Winslow had an emergency in his office. Those hours waiting at the hospital were the most agonizing time of my life. Later, when I visited his family, I learned that before coming to my office, Winslow was actually on the phone with his daughter Caroline, and he told her that he had to hang up because it was time for him to go to the faculty meeting. I cannot help but think, if he had not mistakenly thought about the faculty meeting, he would have stayed on the phone with Caroline a little longer, and he could be still checking his plants in the greenhouse right now. Well, life has no if. Many of us were shocked to realize that Winslow was not immortal. But none of us has any doubt that his spirit will be. For our institution, Winslow’s spirit and legacy are a huge asset that we will do our best to carry on. To conclude, I would like to quote my academic cousin Kevin Folta, who wrote recently in his tribute to Winslow: “He leaves us with a tremendous gap to fill. Maybe the best lasting tribute to Winslow is a commitment for all of us to increase our efforts in serving others. Most of all, do plant biology with a warm smile and endless grace, just like Dr. Briggs would do.” Thank you. Winslow walking with Ann and Peter Quail to dinner. I served as the teaching assistant for Winslow’s course that year. Again, as you all know, he was a stimulating lecturer who didn’t just present facts but talked about the experiments that led to the establishment of the facts. He even talked a bit about my experiments! That caused a fundamental shift in my perception of myself. If he was telling Harvard students about my work, it must really be significant, and I must really be a scientist! During that first year at Harvard, I also met and married my first husband, who planned to do his postdoc at the Weizmann Institute in Israel. Winslow managed to quickly find funding to support me as a visiting graduate student there. And when I returned he let me try to work on a project that I had started there, but which didn’t really have a future. In yet another way and probably the most important way, he supported me when I decided to start a family. I worked throughout my pregnancy, and he let me bring my son David to the lab with me when he was just six weeks old. Perhaps it helped that his daughter Marion was born about the same time, but it was certainly unusual that he still thought of me as a scientist with a future. So the fact that I did indeed have a future, and a very satisfying one in the Department of Molecular, Cell and Developmental Biology at UCLA, I attribute to Winslow’s support and example of what it is to be a scientist, not for fame or fortune, but in order to more fully understand the world. Bob Rabson died March 1 in Madison, Wisconsin. Bob joined the Department of Energy, in the Division of Biomedical and Environmental Science, in 1973 and served as director of the Division of Energy Biosciences until 1995. He devoted his career to biological energy research and created and ran funding programs in DOE supporting research in basic energy sciences. He was legendary for his support of promising early career scientists. A full tribute will appear in the May/June issue of the ASPB News. Advertise in the ASPB News.